Law School, Lagos, obtained his BL and was called to the Bar in 1992. In addition to several professional affiliations, Aminu Tambuwal has also been a very active member of the Nigerian Bar Association (NBA) Sokoto Branch. He also held the position of 1st Assistant National Secretary of the Association. He is a member of the Body of Benchers, Nigeria; International Bar Association, and the American Bar Association among others. Aminu Tambuwal worked as personal Assistant on Legislative Affairs to Senator Abdullahi Wali the then senate leader from 1999 to 2000. In 2003, Aminu Tambuwal ran for and was elected into the House of Representatives representing Kebbe/Tambuwal Federal Constituency on the platform of the All Nigeria Peoples Party (ANPP). Presently he is the Speaker of the House of Representatives of Nigeria. He however defected to the Democratic People’s Party (DPP), alongside the former governor of Sokoto State, Attahiru Bafarawa before the 2007 elections. But when the DPP denied return tickets to former ANPP legislators, Tambuwal swung back to the ANPP, where he eventually succeeded in picking up a ticket for the election. Aminu Tambuwal has held several offices in the House. In 2005, he became the Minority Leader of the House until he defected to the PDP. He was also elected the Deputy Chief Whip upon his re-election.Aminu Tambuwal has also been a member of several committees. 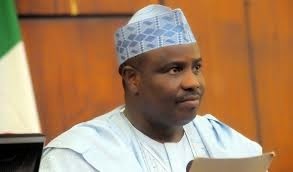 Aminu Tambuwal formally defected from the ruling Peoples Democratic Party(PDP) to the opposition All Progressive Congress(APC) on October 28, 2014. He contested for the Governorship in the April 2015 elections and won under the Platform of the APC.